In electronics, Servo motors are mostly used in Robotics Projects because of their accuracy and easy handling. Servo motors are smaller in size and they are very effective and energy efficient. They provide high torque and can be used to lift or push weights according to motors specification. In this tutorial we will learn about Servo Motor and How to interface Servo with STM32F103C8 board. A potentiometer is also interfaced to vary the position of the servo motor’s shaft, and a LCD to display the angle value. In STM32F103C8, we have 10 ADC pins (PA0-PB1), and here we use only one pin (PA3) for analogread() for setting shaft position of motor by potentiometer. Also among 15 PWM pins of STM32 (PA0, PA1, PA2, PA3, PA6, PA7, PA8, PA9, PA10, PB0, PB1, PB6, PB7, PB8, PB9), one pin will be used for providing pulses to the Servo motor’s PWM pin(usually it is orange in colour). 1. The potentiometer on the right is used to vary the LCD contrast. It has three pins, left pin is for +5V and right is for GND and centre pin is connected to V0 of the LCD. 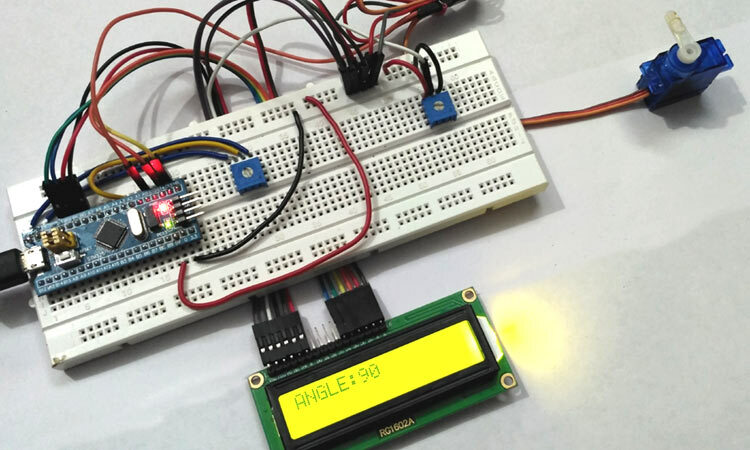 Like our previous tutorial, we programmed the STM32F103C8 with Arduino IDE through USB port without using FTDI programmer. We can proceed programming it like an Arduino. Complete code is given below at the end of project. Here we have created variable servo with datatype Servo and attached it to previously declared PWM pin. As the digital output is 12-bit resolution, we need to get values in range of degree (0-170), it divides ADC (0-4096) value according to max angle 170 deg so we divide with 24. Below statement makes the servo motor to rotate the shaft at angle given. Complete code is given below and well explained by comments. I'm new to electrict and i'm following your article but i don't know where to get Servo.h, can you give me an advice to get it?